Saturday May 6th saw 60 people descend upon the velodrome track at The HSBC National Cycling Centre for the first Cyclone24 to be held in Manchester. The first ever 24 hour challenge to be held at this velodrome saw riders of all ages and abilities face the unenviable task of staying awake for 24 hours, whilst battling physical exhaustion and mental fatigue, not to mention the frighteningly steep 42 degree banking, as they took to the track in teams of six to cycle the 250m laps right through until the next day. The cyclists taking part covered 31,996 laps in total, an astounding 4,971.5 miles; the equivalent of cycling further than Manchester to Tibet. 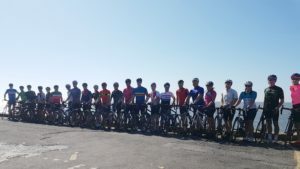 A team of six from online magazine road.cc, led by captain Stu Kerton, took the top spot and were named the winning team for cycling the furthest distance in the 24-hour timeframe. The team cycled 3676 laps in total, not only making them champions of this event, but also taking them straight to the top as overall challenge record holders, beating the previous record of 3507 laps. Our Manchester event also saw our second ever all female team, aptly named The Dream Team. The ladies finished in 6th position with a total of 3240 laps and an average speed of 33.7kph. The fastest lap was taken by the Tour De Manc/Secret Training team in 15.64 seconds. Zoe Westerman, Director of Cyclone24 said: “Our events attract all abilities; social cyclists, those new to track cycling, those more experienced and cycling clubs. It’s uniquely challenging and something new to set training goals for. We’ve received some wonderful support for our inaugural event in Manchester, everyone has really enjoyed the challenge and we’ve raised some money for a great cause. My thanks to all of our event supporters; Battery Drinks UK, Eat Natural, Primal Pantry, Virgin Active, 42 Degrees Coaching and to our event sponsor Stills”.